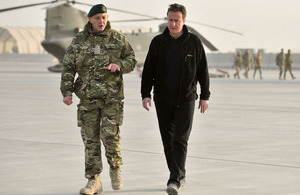 Prime Minister David Cameron has announced a package of measures to provide a significant boost to the military campaign in Afghanistan during his latest visit to the country. Both UK troops and the Afghan National Security Forces will benefit from increased funding and state-of-the-art equipment. • £135m to double the numbers of Reaper Remotely Piloted Aircraft. Accompanied by the Chief of the Defence Staff, General Sir David Richards, the Prime Minister arrived at Camp Bastion, the main British base in Helmand province, yesterday, Monday 6 December 2010. Visiting the Helmand Police Training Centre on the outskirts of Lashkar Gah to present graduation certificates to newly-qualified Afghan police, he revealed that the extra £33.1m would help build or refurbish 48 police stations, including seven to be opened before Spring 2011. These improvements to essential infrastructure, in addition to more resources for training, will help the Afghan National Police appear both more visible and more professional to the Afghan population, enabling them to carry out their role more effectively. The Prime Minister travelled to the main operating base at Lashkar Gah for a briefing by Commander Task Force Helmand, Brigadier James Chiswell, and on the progress made by the Provincial Reconstruction Team to drive social, economic and political development in the area. The Prime Minister also inspected the new Warthog armoured vehicle, which is now operational in Afghanistan, meeting soldiers who crew and maintain the armoured vehicle, which is replacing the Viking vehicle in Afghanistan. Able to operate in the most diverse and demanding environments - including moving through water, climbing steep slopes and crossing drainage ditches - this tracked vehicle provides troops with high levels of protection whilst giving commanders the flexibility to operate in areas where the terrain and local infrastructure mean a more agile vehicle is needed. The doubling of the numbers of Reaper aircraft means troops will also benefit from increased support to ground operations from the air. Reaper provides live, detailed images of the area in which troops are operating, 24-hours-a-day, allowing commanders on the ground to make more informed and effective decisions to defeat the enemy. Uniquely for this type of aircraft, Reaper is also armed. It has already proved successful in helping to both detect and destroy enemy targets and IED networks in Afghanistan. As Christmas approaches, I know the thoughts will be of home and of loved ones; I would like personally to thank everyone serving in Afghanistan for the sacrifice they are making. I say to them, it is great work you are doing and we must continue to do all we can to help you endure. This is my sixth visit to Afghanistan, to Helmand province, and my second this year - and what I see is some grounds for cautious optimism. The amount of ground that’s covered by the forces is up, the amount of markets that are open, the number of provincial and district governors that are in place, the number of schools that are open, the level of security - there are lots of signs of positive improvement. I’m delighted that Warthog is proving so successful on operations. Robust and agile, it is a valuable addition to the range of vehicles already available to commanders on the ground, giving them both flexibility and high levels of protection on operations. In addition, the significant increase in air surveillance will mean commanders are equipped with the best information possible when deciding how best to defeat the enemy. This significant increase in resources demonstrates our commitment to ensuring front line troops have the world class equipment they need to help combat the threat of IEDs. I’m excited about using the new Warthog vehicle - we can use Warthog to get where other vehicles cannot go. We can choose between the heavy, grenade or general purpose machine guns. This gives me, as the Warthog commander, the flexibility to tailor my armament to the mission - and that’s a vital capability in order to succeed in the complicated environment of Afghanistan. With this firepower comes good armour. The Warthog can take rocket-propelled grenade hits, machine gun fire and has better protection from IEDs. This combination of firepower and protection is what us Tankies are looking for in a vehicle.